Typical Presbyterian. Conservative, bland, tan, ho hum, but definitely identifiable. They have a number of ministries. These include a men’s breakfast, a knitting and quilting bee, a homework club for elementary school students, and dinner on Wednesday evenings. The bulletin mentioned an upcoming Fathers and Daughters Winter Wonderland Ball. There is one worship service each Sunday. Upland is an eastern suburb of Los Angeles in what is known as the Inland Empire. Once a major agricultural area, the Inland Empire now consists primarily of bedroom communities for folk commuting into Los Angeles. The San Gabriel Mountains lie to the north of Upland and create a spectacular view (smog permitting). The San Gabriels’ highest peak, colloquially known as Mount Baldy, is especially noticeable. 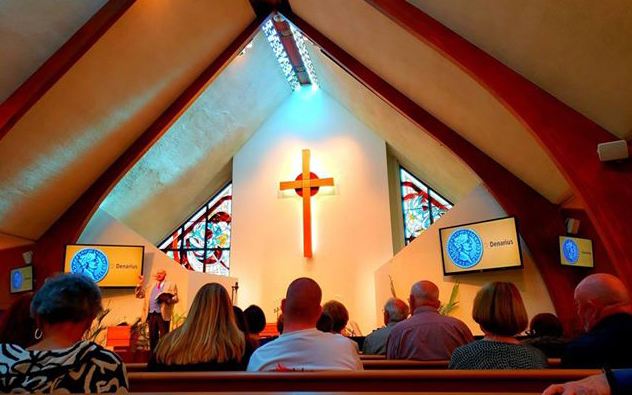 The church is in a standard middle-class neighborhood. The senior pastor was the one who led the proceedings, but there were also a woman who led the worship, plus a variety of announcement speakers. Various people said hello and spoke various other greetings. Comfortable. We were in the middle of the pew, with a couple to each side of us. Churchy, considerate, godly. Good atmosphere for preparation. Bibles were in the pew as well as hymnals, but neither was needed as everything was projected onto a screen. Mostly piano. If there were other instruments I didn’t note what they were. In a pleasant way, I think how attentive, neighborly, and friendly the people seemed. This was a great congregation. Middle of the road. Clapping for one or two songs, but there were hymns, and the church sang like pros. It felt very warm and real. It was conservative, friendly, evangelical, good. 8 — The senior pastor had a personable, professional demeanor, but he seemed to drag on about certain points before landing on the main point at the end. He told us several times that he was not feeling well, so perhaps he can be excused. Don't join a mob. In modern day America we tend to use mobs to get our point across. This is not the Christian way. Remember that it was a mob that crucified Jesus – unjustly! The music was quite good, from the praise and hymns, to the choir, to the various interludes. The overabundance of announcements. There was something for everyone and everyone had to hear about something forever. Please do something about this rather than bore us to death with incessant blathering. We were offered coffee, but we decided to hit the parking lot and make our exit. We didn't stay, but much more than just coffee seemed to be on offer. 10 — The folks were good here. If I pastored a church, this is what I would want. The feel – good to the last drop. People were friendly, hymns were sung well, the pastor dressed for the occasion, and all was good.